This paella recipe is a baked version of the traditional Spanish paella. You can bake it in either a traditional paella pan, which is best as it distributes the ingredients nicely and allows the heat to bake everything evenly, or you can use a large baking dish. Heat the oil in a large pan and cook the chicken over moderate heat until the pieces are brown and partially cooked, about 5 minutes. Remove from pan and set aside. Add the onions, mushrooms and garlic to the oil and cook until the onions are tender. Set aside. Bring the chicken broth to a boil in a large saucepan. Add the seasonings and tomatoes. Combine the browned chicken, seafood, onion mixture, seasoned broth, rice, peas and artichoke hearts. Place the mixture in a lightly oiled 4-5 quart casserole or paella dish. Bake covered at 375°F for 1 hour or until all liquid has been absorbed. Stir once or twice during cooking. Near the end of the baking time, steam 12 clams. To serve, place the clams on top of the paella recipe, then top the dish with pimento strips and olives. This paella recipe can be partially prepared in advance. If the paella is to be prepared in advance, set it aside after you add the seasonings and tomatoes. Refrigerate for up to a day. When you are ready to finish cooking it, combine everything and follow the instructions for baking. Either way you make this recipe, you will love this combination of a tasty rice recipe, a great seafood recipe and a tasty chicken recipe, all combined into a delightful taste sensation. 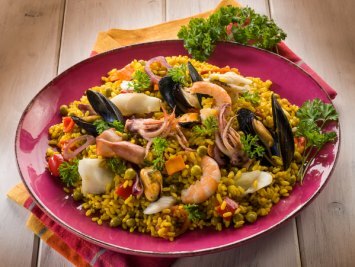 Paella is a very healthy recipe, full of wonderful ingredients. You will need a very large pan for this recipe. Of course a traditional paella pan is best. If you don’t have one, just use a very large frying pan. This recipe can easily be halved if you don’t need to make quite so much. The pimento and olives add both flavor and color. This is a wonderfully colorful dish to serve. This recipe is perfect for entertaining. Just combine it with a large mixed salad and some lovely crusty bread. Because it is really a meal in a pan, it’s an easy meal for entertaining. And guests will love the fabulous flavors. If you like the rice in this paella recipe, have a look here at our other rice recipes.